Sustainable Earth by Staples® Multifold paper towel in white colour measures 9.5" x 9.25" and functions smoothly with dispenser. 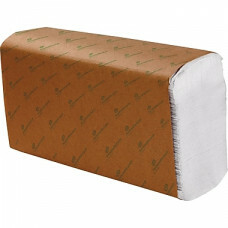 1-Ply paper towel is ideal for commercial/public restrooms and sold as 4000 per case. from recycled materials, so you help save forests when you buy them. These towels are highly absorbent and easy to use. Sustainable Earth by WellnessMed Supply inc. multifold paper towels fit standard 9.5-inch-wide multifold towel dispensers. recycled material, of which at least 80 percent is post-consumer recycled content. hand for use in your washroom or break room.